… is out. And damn, it’s hot. 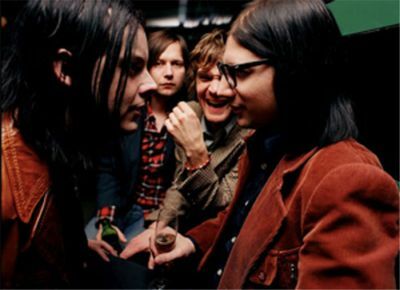 The Raconteurs new album, “Consolers of the Lonely” is out now. As much as I hate bowing to the Websheriff, after reading of the heckling that’s going on regarding this release here, here and here, I think it might be easier not to post a song. But, if you can get your hands on this album, do it. If only for the cracking tune, “Carolina Drama“… it’s one of the more exciting tunes I’ve heard from The Raconteurs to date. Of course, this is a pretty premature evaluation; after all, I’ve only had my hands on this for the last few days… but so far, I’m digging it. While Jack White, Brendan Benson and Co. certainly have their hit and miss moments throughout the album – “Pull This Blanket Off” is an especially needless meandering, and some songs such as “Rich Kid Blues” (although the last minute of this song pulls it back from the brink for me) and “These Stones Will Shout” sound particularly done-by-the-numbers – songs such as “Carolina Drama“, “Salute Your Solution” and “You Don’t Understand Me” more than redeem for these “skip-through” tracks. “Consolers of the Lonely” is definitely Jack White’s release. Although Brendan Benson’s influence is there – particularly on the aforementioned “You Don’t Understand Me”, it would be great if his input matched up to Jack’s here. That’s just an impression after a few listens, so feel free to disagree with that. But I think it would be tough for anyone to stand aside such a huge musical force as Jack White, even Brendan Benson; so it’s not so much a criticism, just an observation. Anyway, as I say… unfortunately I won’t be posting any songs from the album today. But Consolers Of The Lonely is out now on XL/Warner. You can purchase and download it at the band’s site. Previous Post G Love and Ozomatli… at the Tivoli. Next Post Pennywise new album “Reason To Believe”… free through Myspace. Thanks for linking to my post. I will never buy another product from this band–or Warner–again. Their harassment campaign was the ultimate in pointless bullying. No problem! I’m hoping that the incident will inspire intelligent conversation between the two “camps”. Maybe something good can come out of all this.